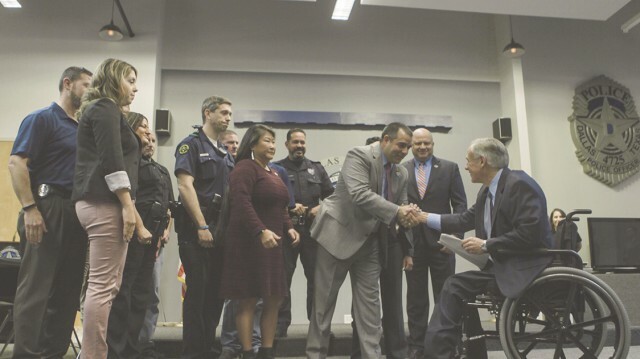 Governor Greg Abbott today visited the Dallas Police Association to announce that Texas will be providing $23 million in grant funding for rifle-resistant vests to police departments across the state. During the 85th Legislative Session, Governor Abbott signed Senate Bill 12, authored by Sen. Royce West and Rep. Phil King, which created funding for the grant program to provide personal body armor to law enforcement agencies throughout Texas. During the announcement, held on Law Enforcement Appreciation Day, Governor Abbott expressed his deep appreciation to all officers who protect and serve their communities across the Lone Star State. "My top priority as governor is to keep our communities safe, and I thank the law enforcement officers who put their lives on the line every day to make that possible," said Governor Abbott. "The job of our law enforcement community is becoming more difficult as the threats our officers face continue to increase. The State of Texas will not sit idly by and tolerate these actions against officers who are simply doing their job to uphold the law and protect the people of Texas. That is why I’m proud to present these grants to Police Departments across Texas so they can equip their officers with the life-saving equipment they deserve." The $23 million in grants announced today will provide law enforcement officers from 453 different jurisdictions around the state with a total of 32,842 rifle-resistant vests designed to protect against high caliber rounds. View a full breakdown of cities and jurisdictions that will receive grant funding for the rifle-resistant vests.